We learned alot these past few weeks about poetry in language arts. 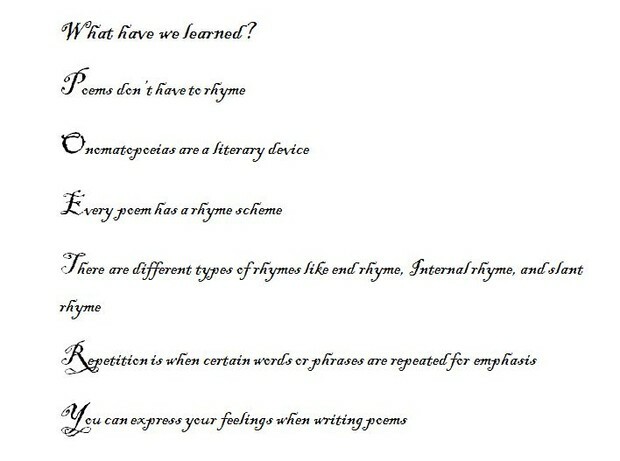 Some examples would be poetic terms and devices, Rhyme scheme, and opened us up to under standing what thoughts go through poets when they write. ~End Rhyme: the most common form of rhyme in poetry, where the rhyming words occur at the end of lines. ~Sonnet: A sonnet is a poetic form. 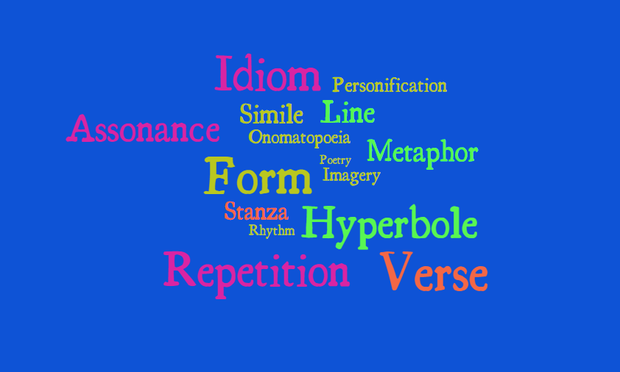 A sonnet contains 14 lines and can have several rhyme schemes. ~Repetition: The repeating of sounds, words, phrases, or whole lines. This is a device poets use to emphasize an idea or create a certain feeling. National poetry day is on October 8, 2015 this year. it is a celebration of poetry and this years theme is Light. The offical month of poetry is April. Click here for a Kahoot!